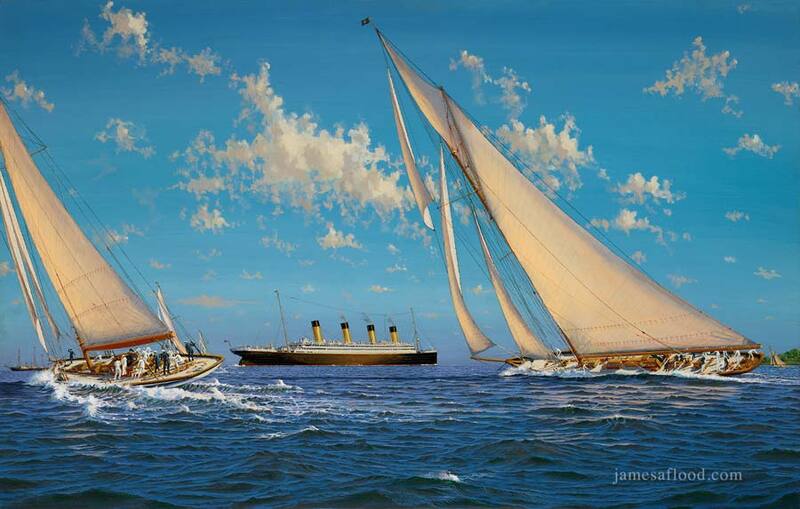 This view shows his majesty's yacht Britannia, owned by King George V, racing with other yachts off Cowes around 1912. In the background steams the RMS Olympic, while further in the distance looms the royal yacht Victoria and Albert. Designed by G.L. Watson, Britannia was built in 1893 at Henderson's yard on the Clyde. She immediately proved herself a success, becoming a champion yacht in her first year. King Edward VII and his son George V regularly enjoyed sailing the Britannia. King George V requested that, after his death, the Britannia be scuttled rather than scrapped.